Is everyone ready for Thanksgiving? I'm half way there. My table has been set for days and I think I have a menu figured out. There might be some final tweaks come Wednesday night, fingers crossed it turns out nicely. K and I will be hosting a small Thanksgiving, just my parents, my brother and his girlfriend. 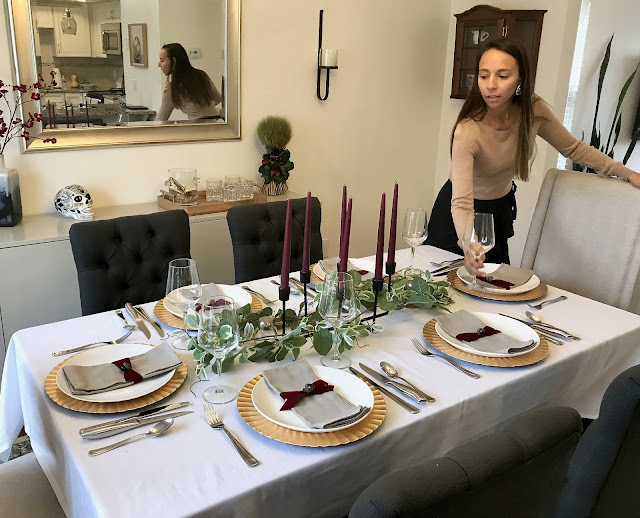 You might remember we hosted my parents and K's parents two weeks ago for a pre-Thanksgiving dinner, see the details here, so I'm trying so not repeat my menu or my table decor. I did reuse all of my main pieces but added some different accessories and the table has a whole other feel. 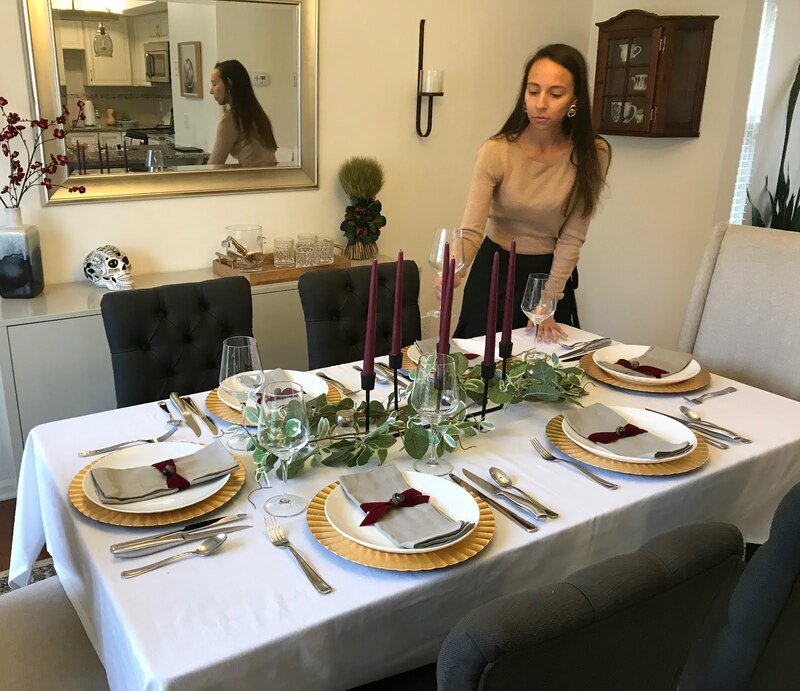 My plates, wine glasses and chargers all made a reappearance along with my silverware, sorry I can not find my silverware online, but it's from Pier 1. 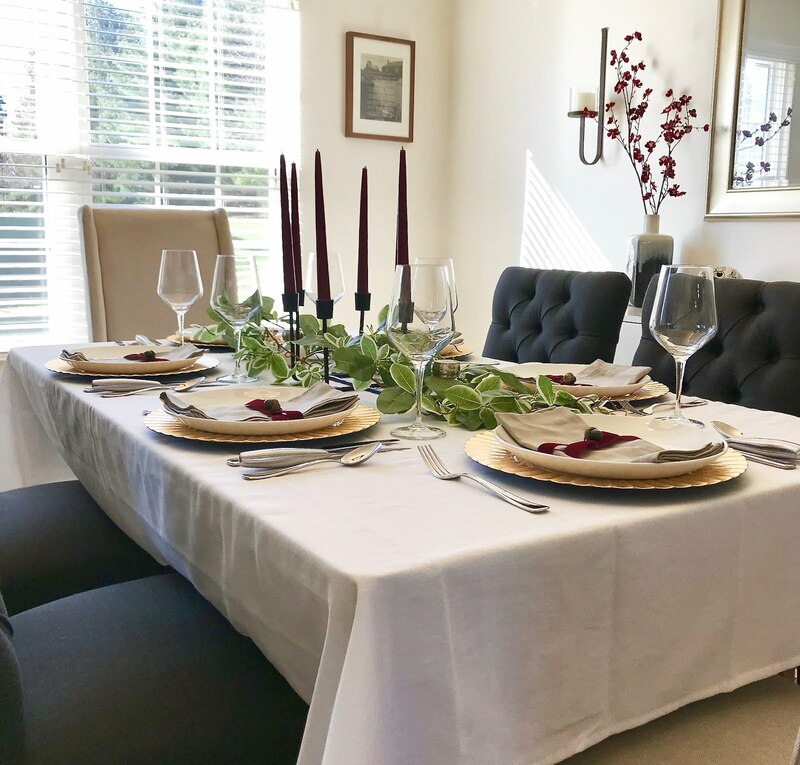 I added a simple white tablecloth from Target, you can find it here, which really makes my table look different and is a clean backdrop for greenery. My plan was so buy some real eucalyptus from Micheals and make a wreath-like piece for my table but while wondering around the store I found a simple, very real-looking wreath similar to this one and decided it would be easier. And I'll be able to put it away and reuse it for another gathering. I love the way the greenery looks but what I love even more is my new candelabra which I found at Target for $20! 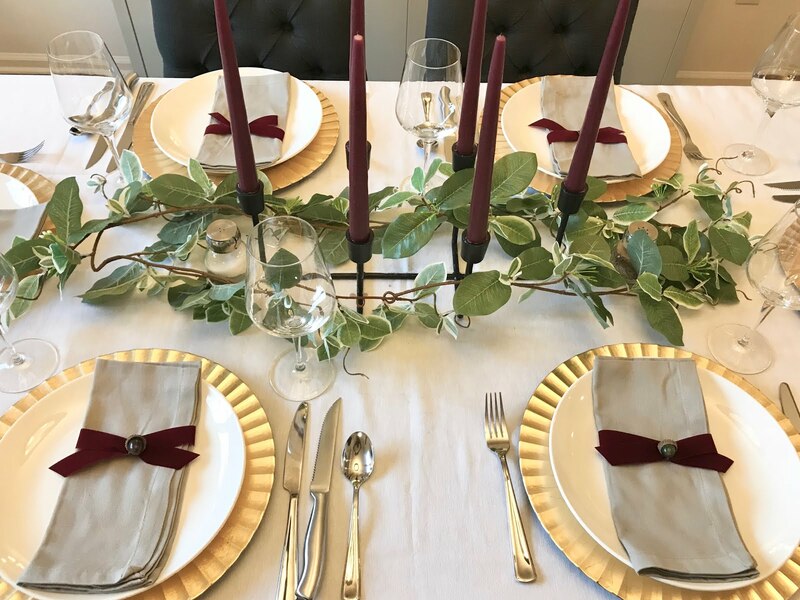 The burgundy colored candles are from World Market as well as the gray napkins. 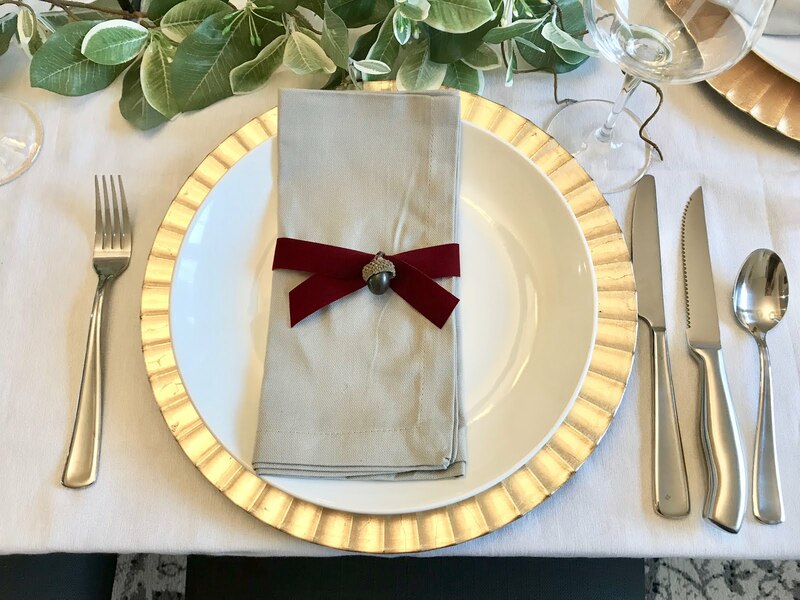 I have these napkins in a red color that I used last year on my table, they are a no brainer so simple and cheap and I think they comes in ten or more different colors. The napkin rings I made out of velvet ribbon and decorative craft acorns. They are identical to the ones I made for this table setting, just larger. My menu will be simple and hopefully easy. I plan on making a large London Broil and a small turkey, my family loves red meat so we do Thanksgiving a little different, cornbread dressing, green bean casserole and red potato mashed potatoes. I want to add a little something more, maybe something made with sweet potatoes or some sort of squash, I just haven't found the right small side recipe yet. I'll make Emeril's Chocolate Pecan Pie , my brother is bringing pumpkin pie and my parents are bringing wine. My mom is also bring Chimichurri sauce for our London Broil, she makes it the best so I don't even attempt to make to. I hope everyone has a lovely Thanksgiving, I am giving myself a short week, only two post this week. But I'll be back next Monday with more fun content! Thank you for stopping by and Happy Thanksgiving!